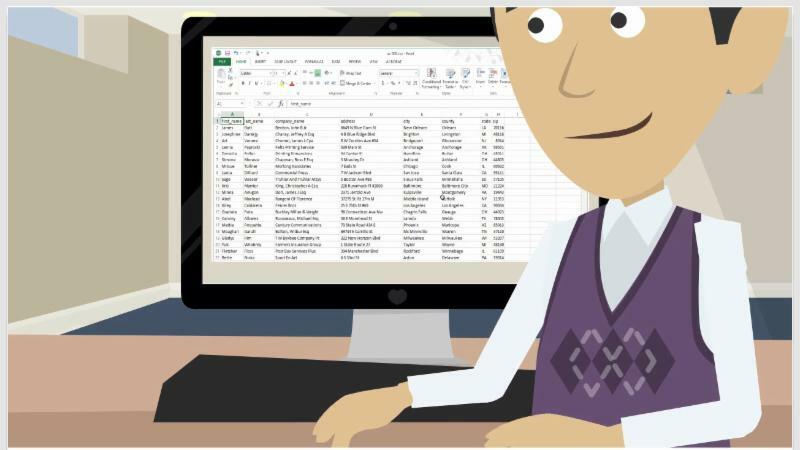 In an earlier article, I described how I created an eLearning lesson that has GoAnimate characters discussing some spreadsheet problems. At a certain point, the lesson zooms in on a character’s computer screen, and suddenly a software simulation starts in Adobe Captivate. The voice of one of the screen characters becomes the voice who is guiding my learner through the spreadsheet lesson. But how did I get the same TTS voice from GoAnimate to Captivate? The secret is, I didn’t. I went the other direction. Knowing that I would want the same voice both in GoAnimate and in Captivate, I created some fake slides in Captivate, with the dialog script for the screen characters I was creating in GoAnimate typed into the Slide Notes. From there, I used the NeoSpeech voices that come with Captivate to create high-quality TTS audio files. Then I imported those files into GoAnimate, assigning them to my characters in the appropriate scenes. Sure, TTS is still not the best audio option, but the effect of having the voice of an animated character you just saw walking and talking in a video smoothly continue as the voice that is teaching you about a spreadsheet is kind of neat. At the end of the Captivate software simulation, you see the animated character again, still talking in that same voice. Of course you might want to have a more human sound to your GoAnimate videos. You can easily do that by recruiting friends, colleagues, or family to play the various roles. Voice acting for screen characters is not just for famous people like Beyonce, who is voicing Nala in the new Lion King remake. You can cast yourself along with Joan from Accounting in your next animated video! Do you have audio tricks or advice for GoAnimate, or for eLearning in general? We would love to share your thoughts below as comments. Looking to become a GoAnimate or Adobe Captivate ninja? We've got you covered with these awesome live, online classes. Our reader Linda Tromanhauser of ADP (Automatic Data Processing, Inc.) writes: "We often use GoAnimate videos in eLearning. One thing I discovered on my most recent project is that in Storyline, you can insert a GoAnimate and have clickable items on top of it, on the same slide. So the video plays, and then the learner can select an option. I thought that was cool." That does sound cool! I have a project under way in which I will add the same kind of functionality in Captivate. But in the meantime, I figured out I could do something similar in Adobe Presenter! Adobe Presenter is a PowerPoint add-in. Taking advantage of GoAnimate’s ability to import PowerPoint, I used GoAnimate to create an animated teacher for a grammar lesson. She talks, moves, points, and discusses text that appears on the slide with her. And then at the end of the video, my animated grammar teacher introduces a quiz. To integrate the video with the quiz I had created in Adobe Presenter, I first created a button image in GoAnimate. 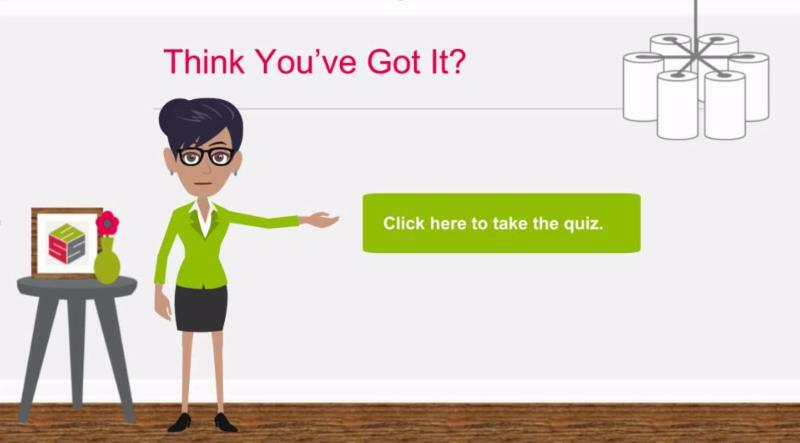 Then I have my animated teacher point to the button and say, “Click here to take the quiz.” To bring functionality to the button, and to bring my learners into the quiz, I took a screen shot of the GoAnimate character pointing to the button at the end of her scene. That screen shot serves as the first slide after the video in Adobe Presenter. In Presenter, I placed a transparent, clickable shape over the button, and assigned it a hyperlink that takes the learner to the next slide: the first question in the quiz. The learner then takes the quiz, the quiz is scored, and the quiz reports its results to the LMS. From animated lesson all the way to SCORM-compliant reporting. There is a lot to love about integrating GoAnimate with eLearning, regardless of which eLearning software you use. Looking to learn GoAnimate? Check these live, online classes. One of the hottest new tools for eLearning development is GoAnimate. Whether you want to create an animated whiteboard video (moving hand draws objects on your screen right before your eyes! ), or a more character-based video (animated characters walk, move, talk, and emote), GoAnimate makes it possible. Even for those of us with limited or no drawing skill or knowledge of how to create animation. I’ve been working more and more on ways to integrate GoAnimate with more traditional eLearning lessons and content. For example, I wanted to add a human, interpersonal touch to an Excel lesson. So I created a GoAnimate video in which one colleague helps another with his Excel spreadsheet. 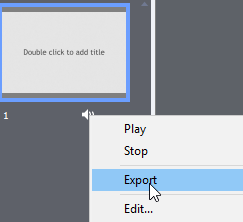 Now, it’s one thing to simply embed a video into an Adobe Captivate slide as a stand-alone, and then go on with a standard Captivate lesson in the next segment. But I wanted a tighter relationship between the video and the Excel software simulation lesson. So at one point in the GoAnimate video, the animated character is sitting at his desk, with his computer screen showing. Check out the computer in the image above... that’s not just a fake image on that screen. That is actually a screenshot of an Excel software simulation created in Adobe Captivate. What happens next is magic. In GoAnimate, I used the Camera Effects to zoom in on the screen, until the spreadsheet simulation was full size. And at that moment, the GoAnimate video ends. And Captivate takes over. Suddenly, the mouse starts moving, the voiceover from the GoAnimate is still talking us through the lesson (I’ll explain the trickery with the voiceover in a later article), and we are into a software simulation demo on Excel. Now that we are in Captivate, the lesson goes on with a training or practice Excel lesson, followed by a graded assessment. Between those segments, additional GoAnimate videos come in and explain what to do every step of the way. By integrating GoAnimate videos with your eLearning projects, you can add humor, engagement, and a fun touch that learners love. But what may be more important, you can publish your projects as fully SCORM-compliant training that can be uploaded to your LMS, with all of the record-keeping and reporting that you may need. Have you integrated GoAnimate videos into your training offerings? We’d love to hear from you. And if you are interested in more on using GoAnimate in eLearning, sign up for Jennie’s live, online GoAnimate course. Looking for GoAnimate training? 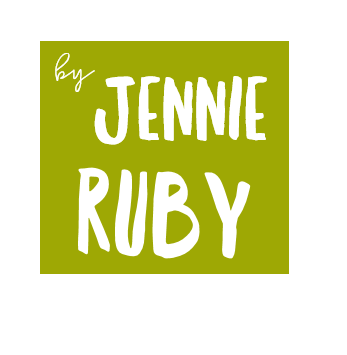 Check out this live, online classes.